Lobster and bread are two of our favorite foods on their own. But what happens when you put them together, like the inspired geniuses at Perry's of Milford, Connecticut did for the first time in 1929? You get an even tastier treat -- lobster sandwiches. Lobster in a bun is as good as life gets. Lobster's place in America has evolved throughout its existence, and along the way, we've put plenty of new spins on the dish. 5 Must-Try Lobster Rolls in the U.S.
Nowadays, diners can find variations of the iconic summer sandwich all over the U.S., available at seafood shacks and restaurants all around the country. Here are 5 to try during your summer travels. My boyfriend and I had strategized our weekend trip to Maine with a carefully mapped selection of local favorites, return-worthy lobster rolls, and breathtaking views from our road trip the year before. We snacked, shopped, and chatted our way up to our destination. Edited down from a 1,001, for your reading pleasure. The most complex part is the opening question: which lobster roll do you want to make? Don't be crabby! It's summer seafood season. Meet Luke Holden, the president and founder of Luke's Lobster, a sustainably focused Maine seafood company based in New York City. Luke is a proud Mainer, or "Mainiac." What about the lobster roll's cousin, the crabmeat roll? When you are on vacation in Cape Cod, there is always the possibility of a rainy day, and the prospect of having to entertain the kids. Lobster rolls, of course, will, not only get the family to temporarily forget rainy day blues, but will also elevate you to hero status. Here, F&W's must-visit spots before Labor Day, from lobster pounds to sno-ball shops. These are making our hearts cringe, guys. 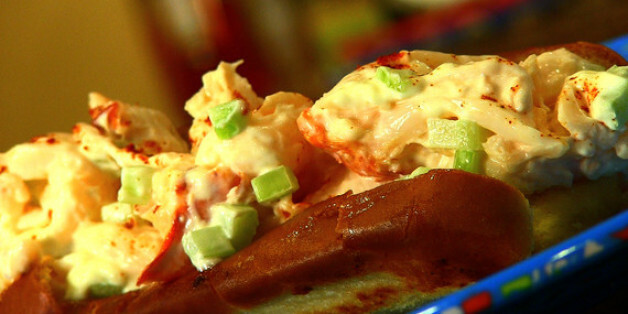 If there's such thing as a perfect food, a great lobster roll could very well be it. Hold the mayo, unleash the butter. Serving everything from kimchi kraut to bulgolgi-covered hot dogs, food trucks are still cool. So many lobster rolls, so little time. With butter or mayonnaise, we won't discriminate. Sandy Couldn't Stop the Beat at Bongo -- Restaurant Opens in Record Time! A killer lobster roll, to die for mac and cheese, and dream-worthy oysters are just a few of the reasons why Bongo is one of my favorite restaurants. About two weeks after Sandy, Bongo was up and running, thanks to hard work, determination and love.